From 8th September 2018 to 24th February 2019, the Loggia degli Abati of Palazzo Ducale hosts the exhibition "Fulvio Roiter. Pictures 1948-2007". 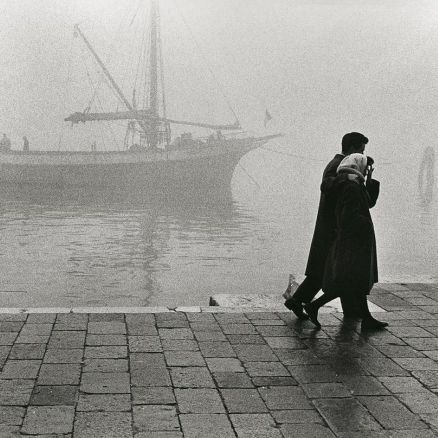 150 photographs, mostly vintage, tell the story of the Venetian photographer Fulvio Roiter, who passed away on April 18th 2016. The exhibition, curated by Denis Curti with the precious contribution of the wife of the artist Lou Embo, will show all the internationality of the work of Fulvio Roiter, placing him among the most significant photographers of our days. Starting from Roiter's first approaches to photography, during the neorealist season - of which the Venetian photographer inherited the compositional finesse - the path describes Venice and the lagoon, but also trips to New Orleans, Belgium, Portugal, Andalusia and Brazil. The exhibition consists of 9 sections, each one is expression of a specific period of Roiter's life and style: The harmony of the story; Between amazement and wonder: Italy in color; Venice in black and white: a self-portrait; The other Venice; Infinite beauty; Beyond reality; Beyond the boundaries; Homage to nature; Man without desires. Tuesday to Sunday, 10 am to 7 pm. Monday closed. Promoted by Regione Liguria, Comune di Genova and Palazzo Ducale Fondazione per la Cultura, the exhibition is organized by Civita Mostre in collaboration with Tre Oci, and it is accompanied by a Marsilio publication.